Check out the cover for Maria Snyder’s third Glass novel, Spy Glass, which will be out in September. Also, great news for our friends overseas – Spy Glass will be released in the US, UK and Australia all at the same time. The first two novels, Storm Glass and Sea Glass, will be released in Australia starting in May. Also, Maria Snyder released the title for her follow-up novel to Inside Out. Everyone can be on the lookout for Outside In sometime next year (she’s just getting started on it). Shiloh Walker, author of Broken, at Book Lovers Inc.
Nalini Singh has posted the blurb for the upcoming Psy-Changeling novel, Bonds of Justice, which is due out July 6, 2010. The Book Smugglers have kicked off their celebration of Steampunk Week. All Things Urban Fantasy has a great collection of new book covers that have recently come out. There’s so many of them, I’m just going to point you to them instead of trying to share them here. Abigail has covers for Yasmine Galenorn’s next Sisters of the Moon series, Harvest Hunting and Gail Carrigers Blameless. Sad news has sprung up today. Lost Boys actor, Corey Haim passed away during the night. He was 38. Secrets of Parenting has come up with a Top 10 List of Vampire Novels and I can’t say I’m surprised by many that are on the list. Granted, I’ve never heard of the series that earned the number 5 slot, but a lot of the others are not surprising. If you enjoyed the The Eternal Kiss collection that was edited by Tricia Telep, then something tells me you will want to mark your calendars for her next collection. 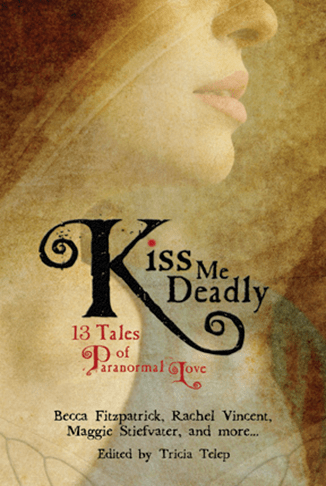 Kiss Me Deadly will feature authors Becca Fitzpatrick, Caitlin Kittredge, Diana Peterfreund, Karen Mahoney (a new story in the same vein as Falling to Ash), Justine Musk, Sarah Rees Brennan, Michelle Rowen, Carrie Ryan, Maggie Stiefvater, Rachel Vincent (a Soul Screamers world story), Daniel Waters, Michelle Zink and Daniel Marks. Kiss Me Deadly will be released July 27, 2010. All Things Urban Fantasy has info on the individual stories. All Things Urban Fantasy has her weekly roundup of contests and this week she’s featuring 138 of them. Suburban Vampire is giving away a copy of Kevin Jackson’s Bite: A Vampire Handbook. Contest ends March 16th. The Qwillery is giving away the first two Kara Gillian novels by Diana Rowland. Contest ends at some point. LOL I can’t believe you listed my Q&A under interviews but thank you. Jackie, Thanks for including my interview at Bitten by Books in your list. Much appreciated!